In a vibrant cherry red colour this lightweight collarless Elena Miro jacket is the embodiment of summery elegance. 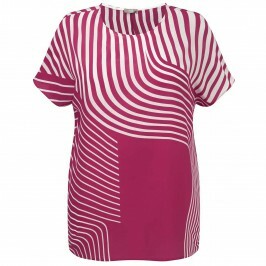 Perfect for the office and evening events alike, just layer over a simple dress or neutral separates, or pair it with the matching cherry red graphical print top. Soft pink jacket with front pocket details. 65% Viscose, 35% Nylon. Delicate machine wash.